Practice writing upper-case and lower-case C by tracing the dotted lines and then color the pictures of the cat, cake and large letter C c.
Color in the illustrations of a cow, a cake, and cookies. Also practice writing capital and lower-case C before making a fun Letter C hat! 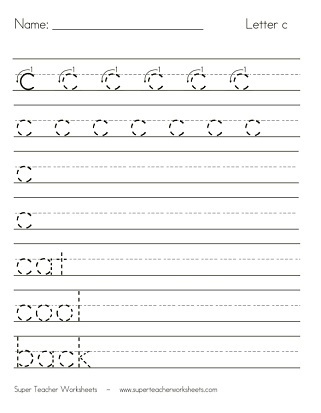 Trace the dotted lines to practice printing lower-case c on this printable worksheet. 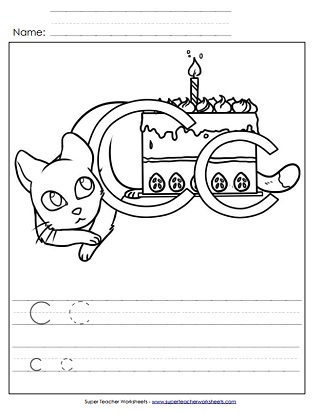 Students will practice printing lower-case c by tracing the gray lines on this worksheet. A handwriting practice worksheet that focuses on upper-case C.
Another worksheet to practice writing upper-case letter C by tracing the gray lines. Find, practice writing, and write words with the letter C c.
Print this worksheet to practice letter recognition by dabbing the circles with a bingo dabber in the shape of letter C.